Although 1992 seems like a much simpler time compared to 2017 so far, it turns out the two periods are strangely similar in the sense that people are buying a questionable alcoholic drink called Zima, a Super Nintendo console is the gaming system to have, and now, a startlingly clear cola is arriving on store shelves. 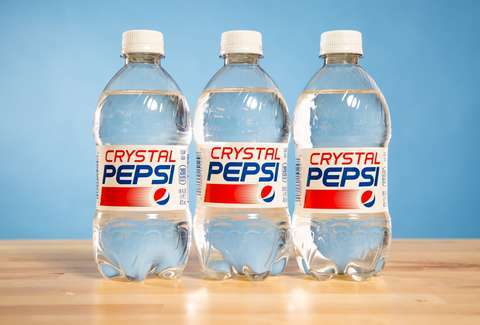 Yes, Crystal Pepsi is coming back. Again. A Pepsi spokesperson said limited-edition bottles of the carbonated nostalgia juice will be available in stores nationwide for the last time ever this August, following the drink's brief comeback in late 2015 and 2016 after 23 years. You'll be able to get your hands on the last 20oz bottles of the sweet stuff during an eight-week run starting on August 14, according to a press release. That's it. After that, the soda will only be another '90s-era memory -- just like your Birkenstocks (hopefully). To celebrate the cult-favorite soda’s final comeback, Pepsi has teamed up with iHeartRadio for a multi-city nostalgia tour with performances by ‘90s artists at stadiums during the 2017 baseball season. The tour kicks off on August 1 with a pre-game concert at Billy’s Sports Bar outside Yankee Stadium, featuring Busta Rhymes, followed by Sugar Ray’s Mark McGrath at Chase Field in Phoenix on August 11 and Salt-N-Pepa at Marlins Park in Miami on August 13. Pepsi said it’s giving away free tickets to the shows via local iHeartRadio stations in each city. Apparently, the shows will also involve free Crystal Pepsi swag, and of course, lots of Crystal Pepsi. The bottom line: if you've never experienced the clear soda that's designed to taste almost exactly like regular dark cola -- or if you're hoping to stock up on the final shipments of the stuff before it's gone for good -- you're about to get your last chance. Tony Merevick is Senior News Editor at Thrillist and is still saving a bottle from the last time it was available. Send news tips to news@thrillist.com and follow him on Twitter @tonymerevick.